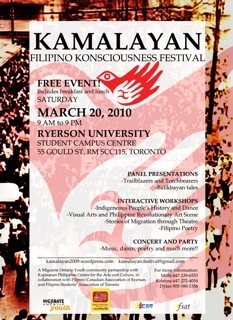 There’s a wonderful event called Kamalayan happening on March 20, 2010. The special all day cultural celebration features panel presentations, Philippine history and culture, migration studies, dance, poetry, and visual arts, and a closing concert party. The event will be held at Ryerson University’s Student Campus Centre on 55 Gould Street, RM SCC115 in downtown Toronto. The event starts at 9 AM and ends at 9 PM. And yes, the entire event is free! Check out the details here and we hope to see you there on March 20! WE ARE THE NEXT CHAPTER OF OUR STORIES!!! This whole-day event will involve panel presentations, discussion, interactive workshops and a cultural celebration. The festival aims to bring together young Filipinos across the Greater Toronto Area for the purpose of building a sense of our identity and community through awareness of our history as a people. Presented by Migrante Ontario Youth in community partnership with Kapisanan Philippine Centre for Arts & Culture, and in collaboration with the Filipino Canadian Association of Ryerson (FCAR) and the Filipino Students’ Association of Toronto (FSAT). THIS IS A FREE EVENT!! IT IS OPEN FOR EVERYONE!!!!! ~ by cpnivera on March 11, 2010.